Jonathan Coulton's latest Thing a Week Code Monkey just hit my ear drums at the right time. Today is going to be long and painful and I have the feeling it won't end until Wednesday, but my morning has been made. It's just dead on. Maybe not the part about the receptionist (no receptionists here), but the boring meeting and boring manager who criticizes code monkey's code and should write the goddamn pages himself, and wanting to get out of this place. 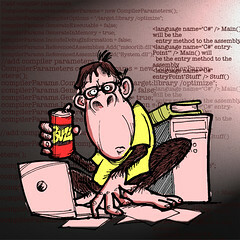 Anyways, code monkey going back to work now.